Regional Academic, Faculty of Health and Social Care. A core tenet of the open educational resources (OER) movement has long been that 'the world's knowledge is a public good' (Smith & Casserly, 2006, p.2) and should be available for everyone to use, reuse and share. However, this vision of openness and of the connection between OER and social justice, which McAndrew and Farrow (2013) observe is currently re-emerging, is limited by the fact that OER-provision is typically top-down, driven by higher education suppliers with the needs of higher education (HE) in mind. As a consequence, the OER that are released can be hard to find for potential users outside HE and often fail to meet those potential users' needs in respect of the content, size, format and level of the OER. Seeking to increase the impact of OER and open educational practices (OEP) beyond higher education we conceptualised a new role for academics - the public-facing open scholar. The role involves academics working with online communities outside HE to source OER to meet the specific needs of those communities. Having developed detailed guidelines for performing the role we piloted it within a voluntary sector child welfare community in order to explore its viability. To date, our pilot findings indicate that the role of public-facing open scholar is both viable and well-received by the case study community. However, the pilot process, conducted in a community which requires all participants to be anonymous, has also highlighted the need to be aware of the impact of privacy constraints when choosing a community with which to work. In addition, the pilot indicated that listening to a community's needs involves more than noting requests for advice and includes attentiveness to a community's culture and typical modes of participation. This, in turn, can help the public-facing open scholar to fit in with the community and gain members' trust. The implications of these findings are wide-ranging. Voluntary sector online communities offer one platform for the public-facing open scholar to realise the transformative potential of open education, raising awareness and increasing the use and reuse of OER by people outside HE. However, the scope for the role is not limited to the voluntary sector and academics could find opportunities to perform the role in many different types of community. Furthermore, whilst we have concentrated on the role of the individual academic, institutional dimensions are also relevant. For example, higher education institutions which formally recognise the public-facing open scholar role as an important component of academic output, rather than an activity which is in tension with the demands of paid employment, may themselves be seen as taking on the role of a benevolent academy that is contributing to a global movement for free and open access to knowledge. The 'spirit of open' (Perryman, 2013) is increasingly a motivating force within global education and necessarily involves maximising access to the knowledge society. Indeed, d'Antoni (2013, p. 137) proposes that 'knowledge societies must strive to be inclusive if they are to further the well-being of all their citizens', while Smith and Casserly (2006, p. 2), focusing more narrowly on one aspect of the knowledge society - the OER movement - suggest that 'at the heart of the movement towards Open Educational Resources is the simple and powerful idea that the world's knowledge is a public good and that technology in general and the Worldwide Web in particular provide an opportunity for everyone to share, use and reuse it.' Smith, Casserly and d'Antoni offer an appealing vision of openness and knowledge-sharing that sadly will remain beyond the grasp of the OER movement as long as resources remain offered by Higher Education (HE) institutions on a top-down, supplier-led basis, rather than in response to the needs of a broader range of potential end-users beyond formal HE. However, to date, increasing access to and awareness of OER in the interests of true openness remains a 'persistent challenge' for the OER movement (McAndrew and Farrow, 2013, p. 69). The shift of emphasis from OER production to Open Educational Practices (OEP) 'which support the (re)use and production of OER through institutional policies, promote innovative pedagogical models, and respect and empower learners as co-producers' (Ehlers, 2011, p. 4) goes some way to moving from a supply-push, educator-driven mode of learning to a demand-pull mode of learning which is responsive to learners' needs and interests, to use Seely Brown and Adler's (2008) distinction. However, the shift in emphasis from OER to OEP is still largely focused on the use of OER in higher education (e.g. OPAL, 2011), rather than open educational practices outside the academy. Seely Brown and Adler (2008) address the potential for OEP outside HE when suggesting that OEP are best enacted in 'rich (sometimes virtual) learning communities' which may involve 'collaboration between newcomers and professional practitioners/scholars'. The role of learning communities in the creation, use and reuse of OER within higher education has had some attention to date (e.g. d'Antoni, 2013, p. 135; De Langen & Bitter-Rijkema, 2012; Fulantelli et al, 2012; Petrides et al, 2012). This paper extends such discussion to explore the potential for OER to be used in communities outside higher education, reporting the ongoing development of one approach to solving the 'persistent' challenge of access to OER - academics performing the 'public-facing open scholar' role. The conceptualisation of the public-facing open scholar role is fully outlined elsewhere (Coughlan & Perryman, 2012). However, a summary is provided here for background. The public-facing open scholar is a revival of the centuries-old role of 'public academic' - dating back to 18th century English scientist Humphrey Davy's theatrical and engaging lectures at London's Royal Institution of Great Britain. Modern day public academics, including particle physicist Brian Cox, philosopher Michael Sandel and anatomist Alice Roberts have gained celebrity status by disseminating their work through radio and television. However, their broadcasting can largely be seen as a supply-push process. The public-facing open scholar role inverts this relationship, with scholars identifying online communities who might benefit from OER in their specialist area, identifying participants' expressed needs and sourcing OER to meet those needs on a demand-pull basis. As such, the public-facing open scholar role is an extension of Weller's 'digital scholar' - 'someone who employs digital, networked and open approaches to demonstrate specialism in a field' (Weller, 2011, Chapter 1). It builds on his argument about the possibilities for public engagement offered by universities' production of 'long-tail' content - the plethora of small learning resources produced by academics (for example videos, podcasts and articles) that Weller (2011, Chapter 7) suggests is 'capable of gathering niche audiences, which collectively would fulfill a large element of a university's public engagement function'. The public-facing open scholar role is a way of ensuring that long-tail content reaches people who really need it. An example could be sharing with a group of parents and carers of children with disabilities the collection 'Growing up with Disability' (http://podcast.open.ac.uk/pod/ke312-working-for-childern) - 12 podcasts between 3 and 10 minutes long, taken from an undergraduate Open University module. Thus far, our developing the public-facing open scholar role has comprised two phases: Phase 1 (discussed more fully in Coughlan & Perryman, 2012) involved scoping the need and potential for the role within the UK's voluntary sector and outlining the parameters of what being a public-facing open scholar might involve. Phase 2, still ongoing, sees the role being piloted in an online community linked with a UK child welfare charity. The results of this pilot are reported in Section 4. Disseminate information to academic institutions about the community's unmet needs. During the pilot process a further step was added between steps 2 and 3 - 'simultaneously, establish your own credibility'. This now appears as step 3 for performing the role and is further discussed in Section 3.3. The first stage of becoming a public-facing open scholar involves identifying a community to work with - a decision which should be based both on the academic's alignment with the community's values and focus, and on an assessment of the OEP-readiness of that community, discussed below. Some academics may have a pre-existing relationship with or interest in a particular community, established through personal experiences, regular donations or voluntary work. Indeed, it is likely that community participants will be particularly welcoming to academics who can empathise with the issues they are raising. Alternatively, an academic may choose to work with a voluntary sector community that is closely related to their subject specialism. It is important to check for any rules regarding participation in a particular community as these may restrict certain types of scholarly activity. Having shortlisted potentially suitable communities with which to work, the public-facing open scholar should assess each community's OEP-readiness - its capacity to be self-educating. Burbules (2006, p. 1) suggests that self-educating communities feature 'an overt commitment to sharing information, initiating newcomers, and extending their collective knowledge' and 'balance the respective values of internal and external expertise' - characteristics that should indicate a community's receptiveness as a group to academics' participation in sourcing OER and giving their time in other ways. Galley's Community Indicators Framework (Figure 1) provides a means of assessing whether a given community is sufficiently well developed to have the capacity to be self-educating. 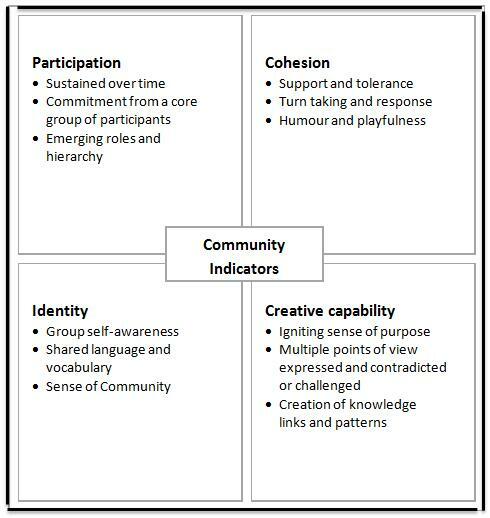 Galley et al (2010) suggest that fully developed communities share four indicators - 'identity', 'participation', 'cohesion' and 'creative capability' - which develop in sequence and can therefore be used to evaluate a community's strength. Figure 1 gives more detail about each of the indicators. The presence of all four indicators suggests that the community has reached the 'creative capability' stage of its development and is therefore likely to have the capacity to be self-educating and, in turn, would be receptive as a group to the participation of a public-facing open scholar. 3.3 Simultaneously, establish your own credibility. One aspect of the public-facing open scholar role was not made explicit originally, but became foregrounded during the pilot process - the need for an academic to establish their credibility with community members in order that a productive working relationship might be developed, in addition to gaining their trust. O'Brien and Torres' (2012, p. 67) literature review of social networking and online privacy, which is largely focused on Facebook, highlights the importance of trust in online social exchanges, referring to Metzger's (2004) argument that 'individuals assess the benefits against the risks in a social exchange, and trust is vital in encouraging individuals to partake in the exchange and disclose information' and Dwyer et al's (2007, p. 2) confirmation that 'trust is a central factor in the social exchange theory and considered an important factor in information disclosure'. Linking to social networking sites (e.g. LinkedIn and Twitter) where an established network of professional contacts and evidence of their participation in that network can be seen - giving an immediately accessible reputation. When choosing which methods to use for gaining trust and establishing their credibility the public-facing open scholar should be attentive to the common practices in their chosen community, in addition to any rules about self-disclosure. They should also follow any guidelines from their employing institution. For example, it is not unusual for academics to be required by their employers to state that they are acting in a personal capacity when communicating through social media. When sharing resources with their chosen community the public-facing open scholar might offer additional support around those resources, for example by comparing and contrasting several resources on the same topic to draw out their strengths and weaknesses, quality, provenance and their level of complexity. This, in turn, could show community members the type of questions they might ask of an OER when judging its likely quality. The public-facing open scholar should also share information about where OER can be found and what resources might be available as the basis for empowering community participants to self-source resources. Repositories for particular subjects can be valuable here, for example SWAPBox (http://www.swapbox.ac.uk/) for social work resources or the NHS eLearning Repository (http://www.elearningrepository.nhs.uk/), as they make it easier for people new to OER to find relevant resources. An academic may find their usefulness to a particular community, and the level of intervention required, ebbs and flows and in quiet periods it can be useful to spend time searching for potentially relevant resources, allowing the academic to share them more swiftly as and when they are needed. The final step in the public-facing open scholar role involves academics disseminating information about their chosen community's unmet needs within their own institution and elsewhere. In particular, they might lobby for further OER to be released to meet these needs, for the license to be changed on an existing resource, or for a resource to be re-released in a more accessible format. Social media such as Twitter and blogs might be a useful platform for drawing attention to unmet needs and such lobbying activities. Figure 2 summarises the various components and phases of the collaboration between public-facing open scholars and communities outside HE. Once the steps involved in performing the public-facing open scholar role had been clarified we then piloted the role in a case study voluntary sector community in order to assess its viability in practice. In Phase 1 of our study (see Coughlan and Perryman, 2012) we had focused our initial scoping activities on the UK's voluntary sector, which uses online communities to support fundraising, disseminate information and promote discussion. We then narrowed our lens to cover only voluntary sector communities where members of the public use discussion forums for peer-support and knowledge-sharing in connection with health, wellbeing and social welfare issues. This focus was continued for our pilot study. The pilot study is still ongoing and involves one of the authors performing the public-facing open scholar role in a child welfare community which uses an open online forum for peer-support and knowledge-sharing. The public can read all posts and consequently there are strict rules on confidentiality and privacy, with all names and any identifiable content being anonymised. This is a contentious policy and many members suggest they would prefer to have closed forums where they can discuss more freely. Every post on the forum is read by a moderator. The forum name is not being publicised here in respect for the community's privacy, though the information is available privately to anyone wishing to verify this research. The forum began in 2003 and has over 25,000 registered members, of whom about 1,600 actively and regularly use the website. Alongside the forums, the community runs telephone helplines and has a page of frequently asked questions (FAQ). The forum does not publish usage statistics but some members' histories show they have been active participants for 9-10 years, contributing up to 10,000 posts. An initially evident core group of members have made between 1000-8000 posts each and, typically, about 200-300 posts are made each day. Popular topics can be viewed 500-1000 times and receive 20-50 replies. The community features all four of Galley's community indicators and has reached the creative capability stage of its development, indicating the capacity to be self-educating. While there is no learning infrastructure, the forum has dedicated areas for 'Suggested Resources' and 'Research and Media Requests'. Posts made in these areas do not get many replies but the few universities that are active in this subject seem to be well-regarded when they crop up in other areas of the forum. Contributing his knowledge and experience in 26 posts, 20 of which were in response to posts by other people and six of which were self-initiated. Five of the posts have been about free/open e-resources, six about topical items in the media, and the remaining posts have been diverse responses to other issues. The posts have generally been well-received, though one post had a Government minister's name removed by a moderator prior to being published. The pilot study has shown that the public-facing open scholar role was viable in the case study community and has resulted in a better understanding of how a community might be selected and about how the academic may participate in it. Some important findings have emerged. There is a clear need for the public-facing open scholar role in the case study community as there are frequent posts requesting help, advice and information - typically at least 1000 per month. Often these posts ask for advice about how to do things or how to respond to unfamiliar events or circumstances. However, reading these requests can be emotionally draining as many community members are seeking support in difficult situations. Performing the public-facing open scholar role will often need to extend beyond just pointing to a wiki or a book in an unmediated way and may necessitate explaining to community members the relevance of the suggested resources. The pilot findings therefore suggest that performing the public-facing open scholar role is likely to require a long-term involvement and, in some communities (notably those focused on sensitive topics), mediating the links to resources will involve a substantial time-commitment. Indeed, it has taken a long time for the researcher to learn about the culture, acronyms, etiquette and personalities in the case study community, despite the fact that there are explicit rules about participation. In less restrictive communities the public-facing open scholar may have to work equally hard to identify the unspoken culture of participation. Above all, the pilot experience has emphasised the importance of step 2 in the role - 'listen to the needs of the community' - extending this to include taking time to learn about the community culture and modes of interaction, in addition to reflecting on the extent to which any resources/links to resources need to be accompanied by an explanation of how they relate to the expressed needs of community members. Interestingly, the case study community members showed quite a different approach to information gathering than that found in academia. For example, the researcher habitually used the MERLOT (http://www.merlot.org/) collection and OpenCourseWare Consortium (OCWC) (http://www.ocwconsortium.org/courses/) search facilities to find resources. However, resources authored outside universities are not always included in these collections. During the pilot, the researcher learned about some valuable non-HE resources through posts made in the case study community forums, for example the 2012 IACAPAP Textbook of Child and Adolescent Mental Health (http://iacapap.org/iacapap-textbook-of-child-and-adolescent-mental-health ), a global publication by the International Association for Child and Adolescent Psychiatry and Allied Professions in Geneva, released with a CC-BY-NC licence, and the resource A Parent's Guide to Autism Spectrum Disorder (http://www.nimh.nih.gov/health/publications/a-parents-guide-to-autism-spectrum-disorder/index.shtml) by the US National Institute of Mental Health (NIMH) - a useful 27-page book offered in Epub and Mobi formats for e-readers, alongside the common PDF format and released under a Public Domain license. Working with a community outside higher education is a reminder that people do not necessarily have access to university libraries. The members of the case study community appear to move in quite different circles from academia, sourcing from welfare agencies and newsletters the resources they share with each other and, in addition, attaching a lot of credence to fellow members' accounts of real experiences. As a result, the knowledge sharing that takes place feels more anecdotal, dynamic and immediate than is typical with some of the knowledge sharing in academia, where the events discussed in research papers can be quite dated by the time the papers are published. Consequently, the researcher has found himself needing to explicitly discuss the value and relevance of the resources he shares, especially those resources with a theoretical, rather than experience-based focus. The level of anonymity required within the community is a marked contrast to social media environments such as Facebook where users are encouraged to post photos and personal information. An effect is to create a level playing field where no-one begins with automatic authority or status. Such constraints are fairly common amongst online communities focusing on child welfare (the researcher's academic specialism) and discussing individual children, where there is an increased need to take precautions against paedophilia, online grooming and child abuse. In the UK, the constraints operating in such communities are often informed by the safety guidance offered by organisations such as the Suzy Lamplugh Trust (www.suzylamplugh.org) and Get Safe Online (www.getsafeonline.org), the latter being the UK Government's preferred online security advice channel. Get Safe Online cautions Internet users to 'never disclose private information when social networking' and to 'pick a user name that does not include any personal information' - advice that is echoed by the Suzy Lamplugh Trust. However, there can be a tension between sharing personal information to build trust, and preserving anonymity for greater safety and security in such communities. This, in turn, has implications for the enactment of the public-facing scholar role - implications that we had not foreseen when conceptualising the role. Step 3 for performing the role - 'establish your own credibility' - would typically involve giving one's name and job title, providing a personal photo and linking to external sites giving verified information about a scholar's academic reputation and network, as discussed in section 3.3 above. However, none of this is possible in the case study community, where even giving one's name and employer in a signature is against community rules, and credibility can only be developed through sustained participation in that community - again, a lengthier process than the near-immediate stamp of expertise that can be gained from explicitly stating one's academic credentials. An anonymous community may therefore be unsuitable for a scholar with limited time available or for someone who wishes to increase their own or their institution's visibility and reputation through their activities. That said, the constraints of anonymity are unrepresentative of social networking in general and it is more likely that academics will encounter non-anonymous communities across their chosen topic areas. Indeed, even within the field of child welfare there are some open online communities that do not require participants to remain anonymous. The next phase of our own research involves our performing the public-facing open scholar role in a selection of non-anonymous child welfare-focused Facebook groups. This should allow us to further explore the relationship between online safety and trust and to explore the ways in which performing the role might differ in Facebook groups and in forum-based communities. McAndrew and Farrow (2013, p. 73) propose that 'beyond the general idea of facilitating access, the values associated with open education have perhaps yet to receive full expression'. Pointing to the work of Heller et al. (2007), Ijsselmuiden et al. (2007), Geith and Vignare (2008), Lee et al. (2008) and Angell et al. (2011), who have all 'sought to connect the OER movement with discourses about public health and human rights in developing countries' McAndrew and Farrow suggest that OER are gradually 'becoming part of a wider discourse about rights and social justice, which goes beyond simply promoting access (and may be seen to reconnect with the original aspirations of the open education movement)'. Public-facing open scholars can contribute to this reconnection between the aims of the OER movement and a wider discourse about rights and social justice by extending the benefits of existing OER to communities beyond the privileged arena of higher education and prompting institutions to release new OER in response to these communities' needs, not least of all in the voluntary sector, where resources are often scarce. 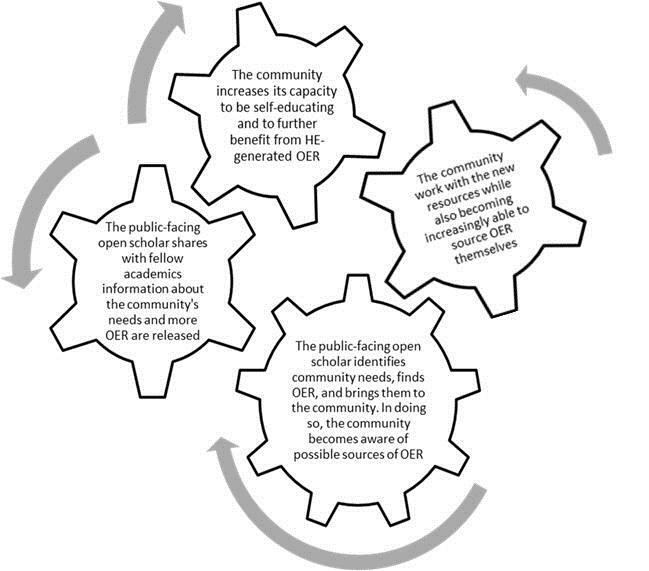 A public-facing open scholar, in identifying relevant OER repositories, could also help voluntary sector online communities to further develop their capacity to be self-educating and sustainable beyond the academic's interventions. In return, the public-facing open scholar benefits from tapping into the collective knowledge and experience of the communities with which they interact. The public-facing open scholar can perform a valuable role in mediating between higher education and the wider world, helping to ensure that the OER released by universities are appropriate for the global lifelong learner in size, level, structure and content and that newly created OER meet unmet user needs. Finally, the realities of working in academia should not be ignored and it is possible that impact of the public-facing open scholar's activities outside higher education may be limited by clashes with the demands of paid work, especially where the employing university is explicitly or implicitly unsupportive of such endeavours. These challenges aside, the public-facing open scholar role gives learning institutions the opportunity to perform their own new role - that of a benevolent academy that takes seriously its responsibilities to civic society. Institutions can achieve this by formally recognising digital scholarship outside the university as 'an activity that is worthy of appreciation' (Weller, 2011) and which has parity with traditional scholarly outputs such as the publication of journal articles, in the interests of achieving true openness and access to the knowledge society. Angell, C., Hartwell, H. and Hemingway, A., 2011. The Emergence of Public Health Open Educational Resources. Health Education 4: 256-265. Burbules, N. C., 2006. Self-Educating Communities: Collaboration and Learning through the Internet. In Bekerman, Z., Burbules, N.C. and Silberman-Keller, D. (eds.) Learning in Places: The Informal Education Reader. New York, Peter Lang Publishing: 273-284. Fulantelli, G., Taibi, D., Gentile, M. and Allegra, M., 2012. Fostering OER Communities of Practice with Teachers. In Okada, A. Connolly, T. & Scott, P. (eds) Collaborative Learning 2.0: Open Educational Resources, IGI Global: 51-71. Galley, R., Conole, G., Dalziel, J. and Ghiglione, E., 2010. Cloudworks as a 'pedagogical wrapper' for LAMS sequences: supporting the sharing of ideas across professional boundaries and facilitating collaborative design, evaluation and critical reflection. In Alexander, A., Dalziel, J., Krajka, J. and Kiely. R. (eds.) LAMS and Learning Design. Nicosia, University of Nicosia Press. 2: 37-50. Heller, R., Chongsuvivatwong, V., Hailegeorgios, S., Dada, J., Torun, P., Madhok, R. and Sanders, J., 2007. Capacity-Building for Public Health. Bulletin of the World Health Organisation 85(12). Ijsselmuiden, C., Nchinda, T., Duale, S., Tumwesigye, N. and Serwadda, D., 2007. Mapping Africa's Advanced Public Health Education Capacity: The Afrihealth Project. Bulletin of the World Health Organisation 85(12): 914-22. Lane, A., 2011. Developing Innovative Systems for Supportive Open Teaching in Higher Education. Journal for the Systemic Innovation of Education 1(1): 32-46. Lee, M., Albright, S., O'Leary, L., Geronimo Terkla, D. and Wilson, N., 2008. Expanding the Reach of Health Sciences Education and Empowering Others: The OpenCourseWare Initiative at Tufts University. Medical Teacher 30(2): 159-163. O'Brien, D. and Torres, A.M., 2012. Social Networking and Online Privacy: Facebook Users' Perceptions. Irish Journal of Management. 31(2): 63-97. Palmieri, C., Prestano, K., Gandley, R., Overton, E. and Zhang, Q., 2012. The Facebook Phenomenon: Online Self-Disclosure and Uncertainty Reduction in	China Media Research, 8(1): 48-53. Petrides, L., Jimes, C. and Hedgspeth, C., 2012. Knowledge Sharing and Collaboration as Indicators of Learning in OER Communities. In Okada, A. Connolly, T. & Scott, P. (eds) Collaborative Learning 2.0: Open Educational Resources, IGI Global: 38-50. Walsh, T., 2011. Unlocking the Gates: How and why leading universities are opening up access to their courses. Princeton and Oxford, Princeton University Press. Walther, J.B., 1992. Interpersonal effects in computer-mediated interaction: a relational perspective. Communication Research. 19: 52-90. Walther, J.B., 1996. Computer-mediated communication: Impersonal, interpersonal, and hyperpersonal interaction. Communication Research, 23: 3-43. Weller, M., 2011. The Digital Scholar: How Technology Is Transforming Scholarly Practice. Basingstoke, Bloomsbury Academic.